Fed up with your run flats? Fancy a change of rubber? Thanks Marco, less grip on the new tyres may still be better than what it's got at the moment! Hi all, sorry if this is covered elsewhere - I had a good look, honest!! About to pick up a 2014 M135i I have found some winter wheels/tyres for sale that 'should' be 17" style 380 wheels. They are a fair way away from me so I want to be sure - where is the part number stamped on these - does anyone have a picture I can send to the seller please? Hi everyone. Members are often asking the same questions on wheels and tyres so I have compiled the following FAQ for this topic based on what members have posted. 1. What are the standard wheel and tyre sizes for BMW 1er? 2. 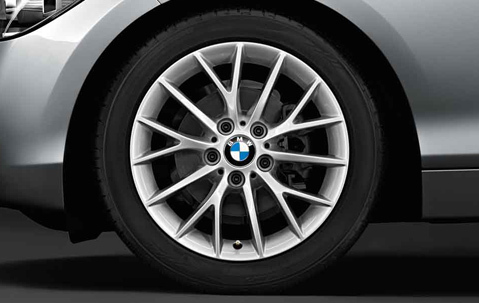 What do the different BMW OEM 1er wheel styles look like? 3. What is the stud pattern for the 1er? 4. Can I replace my RunFlat Tyres ("RFT") with conventional non RFTs on my BMW OEM wheels? a. Your BMW warranty. It appears that using non RFT at least voids your BMW warranty in relation to anything related to the use of non RFTs. b. Your insurance. ie that your insurance company does not consider using non RFT on a 1er to be a modification which voids or otherwise creates an exception to your policy. The general consensus appears to be that non RFT are not considered a modification to your 1er that changes your insurance. c. Legal requirements. Are there any relevant legal requirements in your jurisdiction to carry equipment to deal with any flat? Regardless, owners should consider how to deal with flats from a practical point of view. d. Your safety. Cars fitted with RFT generally have greater control after any (especially sudden) loss of tyre pressure at speed. The run flat tyre indicator works fine with non RFT as the 1er uses an indirect monitoring system. Don't forget to reset it per the 1er owners manual. 5. OK, I've decided to get non RFT- what do I do about any flat tyres? Try using the BMW Mobility Kit (see here) or use a similar third party product. 6. I cannot find 18" non RFT that are identical to OEM spec- what can I use? Widest specs that keep the speedometer as accurate as possible and understeer/oversteer bias with no guard rubbing is 225 40 18 front and 245 35 18 rear (see here). Those wanting more oversteer bias may consider 225 40 18 for both front and rear. 7. Will 255 tyres fit on the rear? Tyre manufacturers generally specify that 255 tyres are too wide for all wheels up to and including 8” in width. However, TUV has certified some 255 tyres for use with 8" wide wheels. See here. Members generally report no rubbing issues for 255 tyres on the standard BMW 18" 208M wheels. 8. What tyres should I use? Depends on your priorities. See here for a recent tyre comparison using the 3er. 9. What non RFT are BabyBMW members putting on their 1ers? 10. Where can I find more info about tyres? I'm happy to add any other questions which the forum is able to work out so hopefully we can make this a fairly comprehensive document that will be useful to all. Please post specific edits as a reply to this topic and I will amend the above based on what is accepted. As always on BabyBMW.net, all care was taken when compiling this information but people should satisfy themselves whether this is indeed appropriate for them before acting on the same. Thanks to all who contributed to this info and helped me compile it. Any errors/omissions please let me know. What about the f22 2 series, is it the same my 240 has 225/40 front and 245/35 rear? I don't normally cross-post, but this might help people looking to see how much a new set of wheels will stick out vs their current wheel. What wheels do you have? Stlye 379 are not a staggered fitment, they're 7.5J front and rear. Same 225/45/17 size tyres all round. Please bear in mind the OP was written back in 2007, 5 years before the F20 was released. The width - not really, but if the offset is different than stock it can add more load on to the wheel bearings. If you are running aftermarket wheels I would expect them to refuse the claim (although it's not a given). I have a mild knock over bumps (suspect a top mount), but I'm going to wait until I've refitted my stock wheels (my winter rims) before having them investigate, why give them any wiggle room. I'm moving from a 118d m-sport to a 220d m-sport convertable and I'm assuming that my 118d winters - 205/55 R16 all round - won't fit the 220d m-sport as it has R18s fitted? So i'll need to source a new 2nd set of alloys for new winters, so could anyone suggest a suitable sized alloy for the 220d m-sport? Your new R18 wheel size does not dictate brake size/clearance, which is the important aspect. I would trial fit a front and a rear before discarding your existing winter set-up.